This procedure involves first creating a thin flap of cornea with an instrument called the microkeratome. Followed by lifting of the flap and laser treatment to reshape the cornea. The flap is then repositioned in its original place. Improvement in vision is noted right from the next day. The beam profile of Wave light laser has been wave front optimized, hence it removes lesser amount of corneal tissue when compared to other laser machines, thus making the treatment more safer for your eyes. Wavefront optimization also ensures that you do not experience any . Both PRK and LASIK procedures are absolutely painless and are performed as outpatient procedure using topical anesthetic eye drops. The entire procedure lasts for only 10 -15 minutes and you will be awake during the entire procedure. During the treatment you are required to look at a fixation light while the laser is performed and you will also hear the noise of the laser machine during the treatment. The actual laser treatment only lasts for 15 to 45 seconds. Following the treatment you can return home immediately. However you should make arrangements for a friend or relative to take you home after the procedure. After going through our site there will be many doubts rising in your mind. We have tried to answer few general questions for more details you can contact us we will be more than happy to be of assistance to you. While most patients are eligible for LASIK, not everyone is. An ideal candidate for refractive surgery ? Must be atleast 18 years of age with stable refraction for 1 year. Must discontinue contact lens wear 2 weeks prior to refractive surgery. Eligibility also depends on the amount of refractive errors , the curvature and thickness of the cornea and a number of other factors that an ophthalmologist must evaluate. Proper patient selection is vital for successful refractive surgery and a satisfied patient. There is a considerable improvement in unaided vision following the treatment. Following PRK the vision improves 3-4 days later once the surface healing in complete. Following LASIK this improvement is noted right from the next day. However a slight fluctuation of vision may occur over the next few months as the healing process continues. Usually most patients are quite comfortable following LASIK. There is a moderate amount of pain following PRK on day 1, which reduces subsequently. There may be transient light sensitivity, glare & foreign body sensation, or dryness in the treated eye. Sometimes there may be a slight under correction or over correction following the procedure. 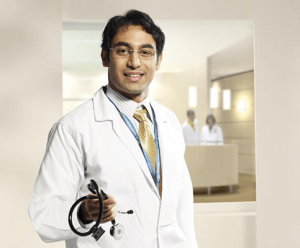 Will I need to wear glasses or contact lenses after the procedure? You can return to work after 3 days if PRK has been performed. Following LASIK you can return to work the following day. While most activities can be resumed, it is better to avoid swimming, contact sports etc at least for a one-month duration. LASIK permanently removes corneal tissue to reshape the eye in order to improve refraction. The physical results are permanent. However, you should be aware that since the eyes can still change with time, LASIK does not prevent presbyopia or affect this condition once it does occur. Ophthalmologists all over the world have been reshaping the cornea using the excimer laser since the 1980s. LASIK has been performed internationally for approximately 10 years now. While refractive surgery does not promise perfect vision, it does hold the promise of reducing one’s dependence on contacts or glasses. For many people the reduction will allow them to more freely pursue their hobbies, sports activities or career options. Cataract or clouding of the natural crystalline lens can be corrected surgically by removing the cataract and replacing the same with an intraocular lens (IOL) implant. 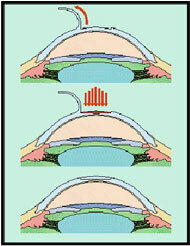 Ultrasound A Scan and keratotomy tests are used for accurate IOL power calculation. Contact Lenses. Imagine you can see the world as sharp and clear from the time you wake up to the time you go to bed. Conductive Keratoplasty (CK) or Near Vision CK is the preferred choice for Refractive Surgery by all the eye surgeons for patients above 40 years of age. It is done to correct Presbyopia by reshaping the cornea with the help of Radio Frequency energy instead of a Laser or Scalpel. As we age, our eyes lose their ability to focus on near points. Reading, seeing the time on a watch, identifying the object near you or working on a computer becomes difficult. This usually begins to occur when we cross 40 years of age. It happens to everyone. Besides Reading Glasses, Conductive Keratoplasty is the only treatment available to correct Presbyopia. Near Vision CK procedure is specifically for people over 40 years of age, who want freedom from Reading Glasses or Contact Lenses. When a patient has gone through a LASIK Surgery or has implanted multi-focal / accommodating Intra Ocular Lenses (IOLs) during Cataract Surgery and still requires Reading and Distance Glasses, then CK treatment can be rendered to cure the problem. It is a safe and minimally invasive procedure which done without cutting and removing of eye tissues. CK is the first US Food and Drug Administration (FDA) approved vision technology for patients with Aging Eyes i.e. Presbyopia. CK is certified by the US Federal Aviation Administration (FAA) as a vision correction procedure for Pilots who want to reduce/eliminate their dependency on Glasses or Contact Lenses. CK is the only safest and most effective procedure to obtain a FAA protocol for Refractive error correction. Have difficulty in reading the newspaper or identifying other objects which are close to you. The Procedure is done with the help of View Point CK System (from Refractec) which uses the probe with a Micro thin (90u diameter) single use KERATOPLAST tip for delivering Radio Frequency energy directly to the corneal stroma. RF is one of todays most advanced surgical technologies. In addition to its use in CK, RF technology is being used in prostrate cancer therapy, back surgery and even cardiovascular procedures. Your eyes will be examined using equipments as unique as the Wave front technology itself. To assist our doctor please do not wear soft/rigid Contact Lenses for a minimum period of two week beforehand, as they distort the cornea and might influence the outcome of the treatment. If you have any old prescriptions for Contact Lenses or Glasses or details of any eye treatment you have altered over time, we can best determine how to treat them. STEP-I: Topical or Eye Drop anesthesia is applied to numb the eye and to ensure a painless procedure. STEP-II: A circular treatment pattern is imprinted on the cornea using rinse away ink to guide the doctors treatment. STEP-III: Using a probe, which is thinner than the strand of human hair, Radio waves are applied in a circular pattern to shrink a small area of collagen in the cornea. STEP-IV: The circular treatment patterns will act like a belt tightening around the cornea by increasing its overall curvature to improve near vision. Before you go home, our staff will give you personalized aftercare instructions and eye drops. After the procedure, you will experience watering of the eyes for a certain time. This is a natural process, but please do not rub your eyes. After the surgery, we recommend you see us as advised. 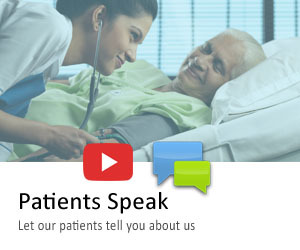 This way you can help us properly monitor the success of your treatment. CK is the most attractive alternative for low postoperative hyperopia in a Cataract patient after Multi-focal or accommodating IOLs implantation. It is less invasive and traumatic than bringing patients back for another Intraocular procedure. There are NO reported serious, sight-threatening or unanticipated safety events. Is Conductive Keratoplasty (CK) permanent ? Conductive Keratoplasty is for temporary reduction of farsightedness. No matter what type of procedure is performed, our eyes inevitably change as we age. Conductive Keratoplasty SM (CK) can turn back the clock on farsightedness. Will my vision improve immediately after surgery ? Is Radio frequency (RF) energy safe for use on the eye? Will my vision fluctuate after the procedure is performed? Most patients will experience mild fluctuation in their vision after surgery, but many will never notice it. Any fluctuation will usually subside within a few days. Are both eyes corrected on the same day ? Will I have to wear patches over my eyes after the procedure ? What will I feel during the Near Vision CK procedure? The Near Vision CK procedure is considered painless. You will be aware of a support (speculum) which helps to hold and keep your eye open. The most common sensation which a patient experiences is a feeling of pressure on the eye only for a few seconds. With CK, the majority of patients are able to return to work and other normal activities on the day of their procedure. Although recovery is fairly quick, it is advisable to be careful with your eyes and avoid any over strain for a couple of days. Can Conductive Keratoplasty (CK) be financed? Because Conductive Keratoplasty is an elective surgery (Cosmetic), most health insurance plans do not cover it. Retina-Vitreous and Uveitis Service at Apollo Hospitals, Jubilee Hills , Hyderabad offers care for medical retina problems like diabetic retinopathy, age – related macular degeneration, retinal vascular occlusions, retinal vasculitis, central serous retinopathy, HIV-related retinal problems and surgical problems like simple and complex retinal detachment, infectious endophthalmitis, and vitreous haemorrhage. Management of uveitis is customized and includes patient-specific investigation, judicious use of immuno suppression when indicated.